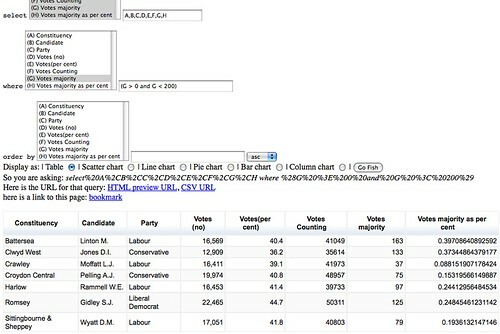 Over the weekend, a bit of random googling with filetype:csv OR filetype:xls limits turned up an archive of what looked like a complete set of UK general election results from 2005 on the Electoral Commission website. 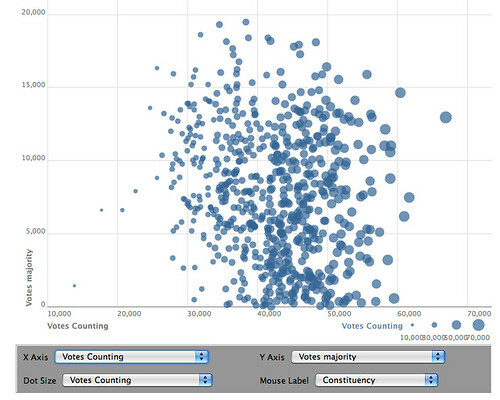 In order to use the Many Eyes treemap to it’s full effect, I needed each row to start with the constituency name. Looking at the above screengrab of the Electoral Commission data, we see that the constituency is only explicitly stated for the winning candidate. So what’s the best way of filling in the blanks? In a couple of recent talks, I’ve made the claim that library folk should be in the business of teaching on effective data handling skills, and this is a good case in point. So what would you do? 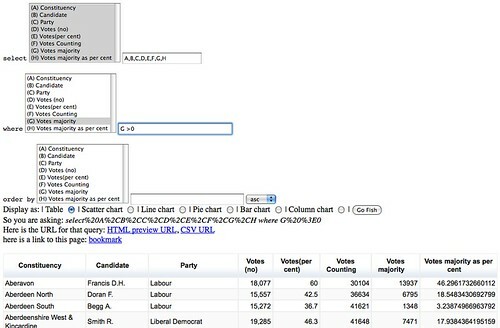 The naive response is to go into the spreadsheet and by hand click and drag each separate constituency name into the blanks. With over six hundred constituencies, that should take you how long..?! delimiter=',',    # Your custom delimiter. skipinitialspace=True): # Strips whitespace after delimiter. if line: # Make sure there's at least one entry. As ever, most of the above code isn’t mine, it’s stolen (in this case, from Stack Overflow). – one containing the number of votes the winning candidate beat the second placed candidate by divided by the total number of valid votes cast, given as a percentage. So how would you calculate those items? Go on – think about it – how would you do it? 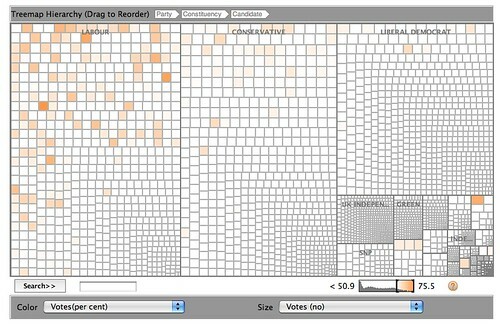 The percentage value is found simply by dividing the absolute number of votes majority by the total number of valid votes cast and multiplying by 100. I uploaded the data to Many Eyes here. 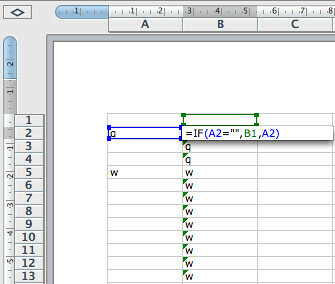 What I will do though is consider the first point, specifically how we might just look at the data for the winning candidates… One way of achieving this is to use Google Spreadsheets as a database using the Google spreadsheets API as described in First Steps Towards a Generic Google Spreadsheets Query Tool, or At Least, A Guardian Datastore Interactive Playground. We can also use the Datastore explorer to interrogate the database. 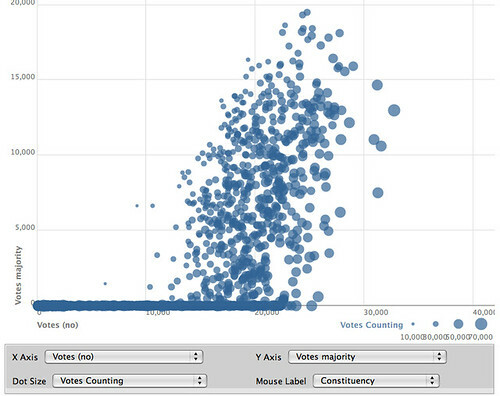 For example, which MPs are defending a slim majority in terms of absolute number of votes? Okay, that’s more than enough for now – this was only supposed to be a half hour post… What I hope this post has done, though, is show how I mix and match tools and techniques as a I wander around a data set, as well as happily trawling the net to look for solutions to problems that I’m sure someone else must have solved before (such as summing a number of separate items labeled the same way in an Excel spreadsheet). It would be good to know what the visualisations ‘meant’ to you at each stage – what did they tell you either about the data or about what else you needed to do to find something meaningful in it? This web page is more informative than many others. followed by a list of parties and votes cast in each constituency. not so, any help would be gratefully received.